All of the women in my family are naturally great cooks. I consider myself a “work in progress” when it comes to the kitchen, but I never shy away from cooking something new, following a family recipe, or making things up as I go. Luckily for my immediate family, my meals turn out pretty good, thanks in part to the foundation of good cooking I experienced and was taught growing up. Learning how to cook is not only about eating nutritiously but also about creating memories in the kitchen that transcend for generations to come. I reached out to some friends that grew up in Latin American households to tap their mamas for their favorite healthy Latin recipes. These clean recipes are rooted in love and have been passed down from generation to generation, and I’m thrilled to have them in my own arsenal now. Our first recipe is part Caribbean part vegan. This dish is a staple at the home of some of my nearest and dearest in Miami. My aunt prepares this for her son and his family on the regular using the picadillo seasoning recipe she inherited from her mother. Season your meatless meat with your all-purpose seasoning. Heat the olive oil, garlic, onion, and bell pepper(s) together in a pan. Add ground meatless meat and cook until meat is browned. Cover the skillet and reduce heat until meat is cooked thoroughly. Preheat oven to 400 degrees. Brush your eggplant with olive oil and season it with a little bit of salt and pepper. Place eggplant onto a baking sheet with the skin side down in the oven. 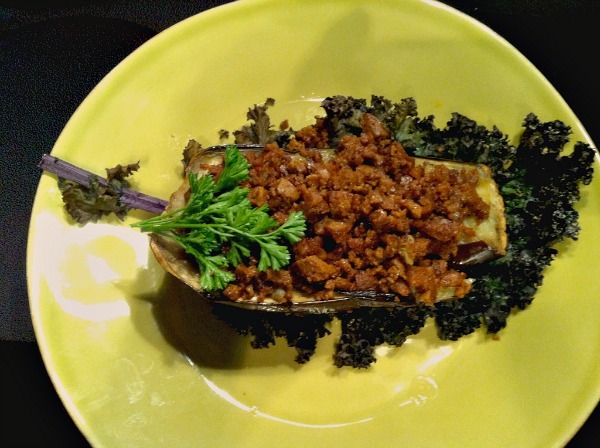 Roast eggplant in the preheated oven for about 25 to 30 minutes or until it’s golden brown. Add ground meatless-meat picadillo, and dinner is served. This recipe also makes its way from Miami from my half-sister Monica. 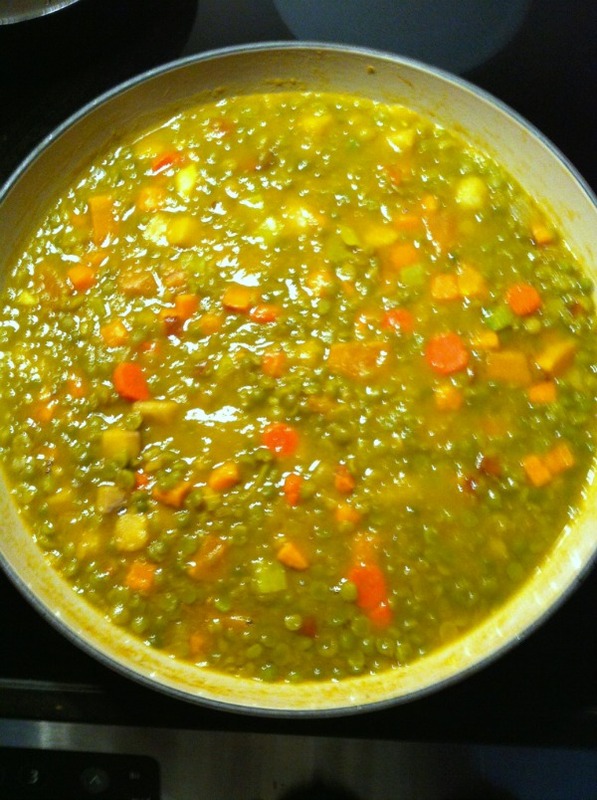 There’s nothing like split pea soup for warming the soul. Many Cubans use chorizo for this recipe—try it the traditional Cuban way or use ham if you prefer. My mother always made this soup for my sister and me growing up. It’s very Cuban and VERY delicious. I like making it for my husband today. It takes me back to my childhood. 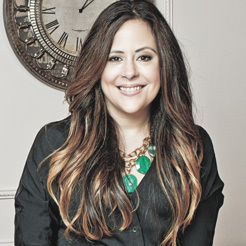 –Monica M.
Rinse split peas and set aside. Dice the chorizo into small cubes. Wash, peel, and dice potato and/or sweet potato into small cubes. Add olive oil to large soup pot over medium heat. Add minced garlic cloves and stir in oil. Next, add your chorizo, potatoes, split peas, and oregano. Let those ingredients marinate for a minute. Add water and boil over high heat, stirring every so often. Once the soup comes to a boil, reduce heat and simmer uncovered for about an hour, stirring occasionally. Be prepared for the delicious smell to take over your kitchen. Enjoy! Image and recipe by Monica M.
This next recipe is brought to us by Yesenia Almonte and hails from the Dominican Republic. 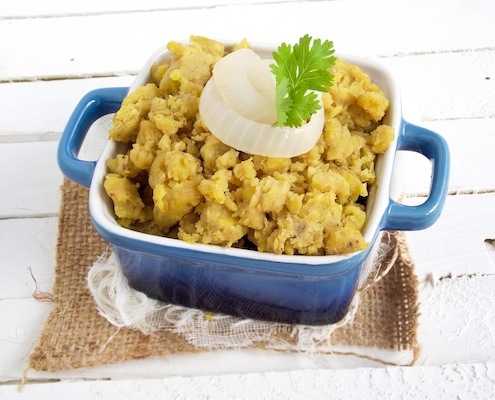 Mangu is a traditional Dominican dish that is typically served for breakfast. Yesenia swears you won’t want to eat anything else throughout the day after this filling dish. The dish is mashed plantains with fried eggs, white cheese, and salami topped with fried pink onions—they call this the tres golpes, a trifecta of pure goodness! For a lighter, healthier version of this meal, try it with a hardboiled egg or egg white. Also, swap out the white cheese for white veggie mozzarella cheese. Peel and boil green plantains, then mash them until smooth, using butter and some of the boiled water. This technique makes the plantains creamy and smooth. Fry the eggs, white cheese, salami, and onions, then place over the mashed plantains. Viandas are starchy tropical roots mostly consisting of malanga, yuca, and sweet potatoes. Being that I love all three of these root veggies, I’m delighted that they are most often included in Cuban recipes—especially in this quick and healthy lunch or dinner recipe that you can make any day of the week. Cut up your vianda pairings. (I like to use malanga, yuca, and sweet potatoes together whenever possible.) Place a spoonful of olive oil in a skillet and place your viandas in the pan. Saute in the pan by adding red onions and drizzling with a little more olive oil and Goya Adobe complete seasoning. To toast further and make your dish look and taste extra special, place the pan in the oven at 350 degrees for about 10–15 minutes to cook in the flavors. Enjoy a toasty, hearty meal. This recipe was done by my mom and is one of her favorites as it was passed down by her mom. It’s traditional Cuban style arroz con pollo. This is how I prepare it at home when the occasion is more relaxed. Season chicken with adobo. Heat oil in large skillet over medium-high heat. Add chicken to pan; cook until golden brown on all sides, about 5 minutes. Transfer to plate. Add onion and peppers to pan. Cook until vegetables are soft, about 5 minutes. Add garlic to pan; cook until fragrant, about 30 seconds more. Pour 2 cups water into pan with vegetables; bring water mixture to boil; add rice and chicken to pan. Return water to boil; boil 1 minute. Lower heat to medium-low; simmer, covered, until water is absorbed, rice is tender, and chicken is cooked through, about 25 minutes. 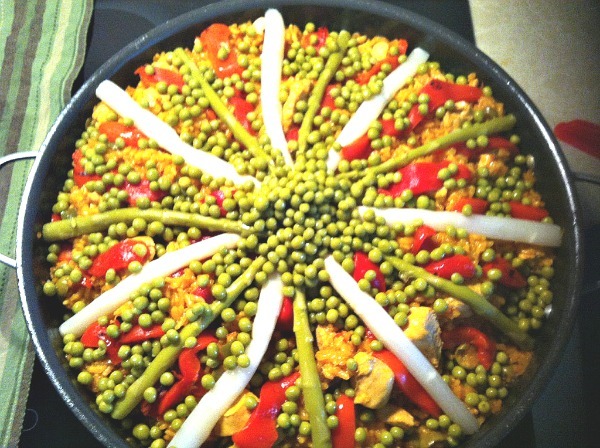 Arrange pimientos and peas over chicken and rice. Like many ladies out there, Donna Ladd, co-founder of Motherburg.com, had a grandma that was an amazing cook, and she has spent most of her adult life trying to master those recipes. And what better way to practice than to whip up a recipe on one of these crazy-cold days? In this case, it is a big pot of comfort soup. 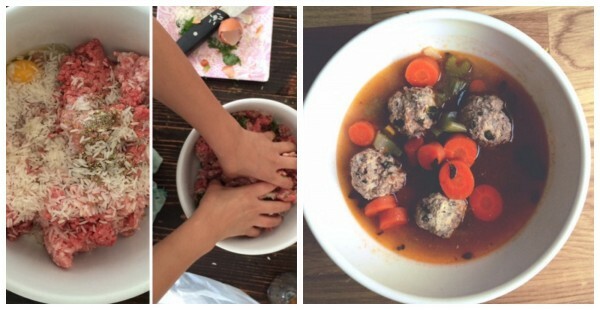 Donna has shared her Grandma Montez’s famous albondigas soup. It is a meatball soup, and it is the ultimate comfort food. Here is the recipe. To make the broth, first chop up carrots and celery. Either mince garlic and onion or throw in the mixer to blend it almost to a paste. Pour all of the broth ingredients into a medium pot, and set at a high heat to get it boiling. While broth is starting to boil, chop up mint and parsley. To make the meatballs, add the ground meat to a large mixing bowl and add all ingredients. Using your hands, mix all the ingredients together and add one egg to make sure the mixture doesn’t get too runny; if it feels pretty solid, add the second egg. You do not want the meatball mix to get runny; it should feel almost like you’re making a meatloaf. After all ingredients are mixed, start making your meatballs. Donna makes them golf-ball sized. Add the meatballs to the boiling broth. This is important—the boiling broth means that the meatballs will start cooking immediately and won’t fall apart. 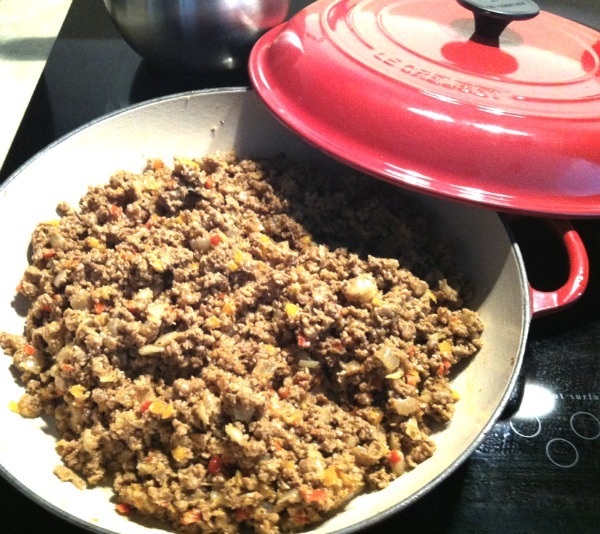 Picadillo, or spiced ground meat, is a versatile favorite meal to many in the Caribbean but especially to Cubans. We put it on everything. Here my mom’s younger sister nails the dish for you to copy at home. Ideally, it’s best if you marinate your meat overnight in the fridge using Goya Adobo All-Purpose Seasoning. If time is not on your side, you can just add the seasoning when preparing your dish the day of. Heat oil in 12” non-stick skillet over medium-high heat. Add onions; cook, stirring occasionally, until soft, about 7 minutes. Add beef to pan. Cook until well browned, about 5 minutes. Drain and discard fat from pan. Add Sazón Goya, adobo, and cumin to meat, stirring to combine; cook 1 minute. Add sofrito; bring to simmer. Stir in tomato sauce, ½ cup water, and olives. Bring liquid to boil. Reduce heat to medium-low. Simmer, stirring occasionally. Serve with rice, in a sandwich, or by itself. 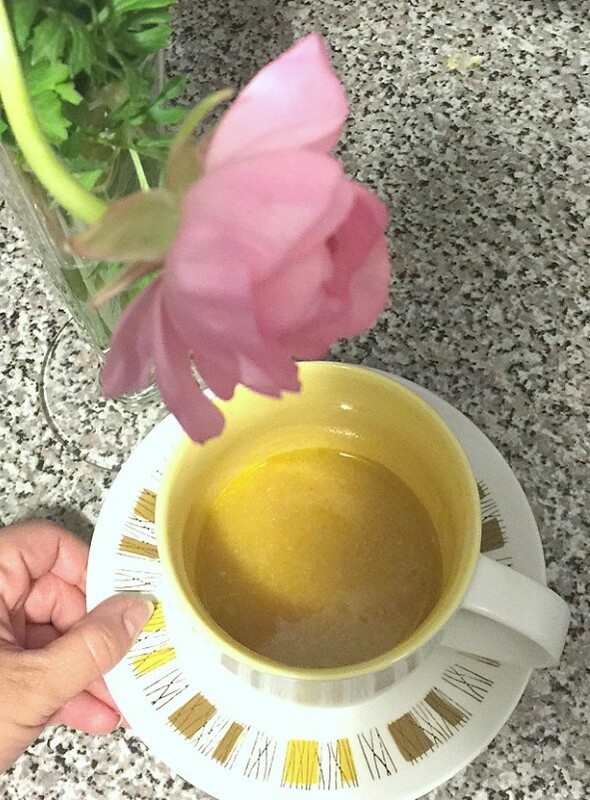 Traditional Cuban chicken soup is just good for the soul, and this one is good for you all around. Zesty, warm, and rich with nutrition, this savory puree soup will warm you from the inside out. Heat a large pot over medium-high heat, add one teaspoon of olive oil, Sazón Goya, chopped onions, garlic, and chicken, and saute for 5 minutes. Add water (14 ounces) slowly and blend for 15 minutes. Add the vegetables and cook 10 minutes until softened. Remove vegetables and place them in a blender to get a creamy consistency; then pour back into the pot, add the noodles, and cook for 10 minutes. This last dish is very Puerto Rican, delicious, and healthy. It comes from my good friend Michelle—make this recipe your own and top it off with a slice of avocado as demonstrated here. Wash and peel the yuca, yautia, and name, and cut into large pieces. (You can also find these three ingredients already peeled and sliced in the frozen food section of a Latin grocery store.) Place ingredients in a stock pot filled with water. Boil all ingredients for approximately 45 minutes or until they soften. Boil the bacalao for 15 minutes. Drain water from pot, but save 1 cup of the water. Place the bacalao in a bowl and shred it with a fork. In a pan, add olive oil and garlic and simmer for 2 minutes. Then add tomato paste, the cup of water the bacalao was boiled in, and the Sazón Goya, and simmer for 2 more minutes. Add bacalao and simmer for 3 minutes. Finally, add onions and red pepper and simmer for 5–7 minutes to soften the onions and peppers. 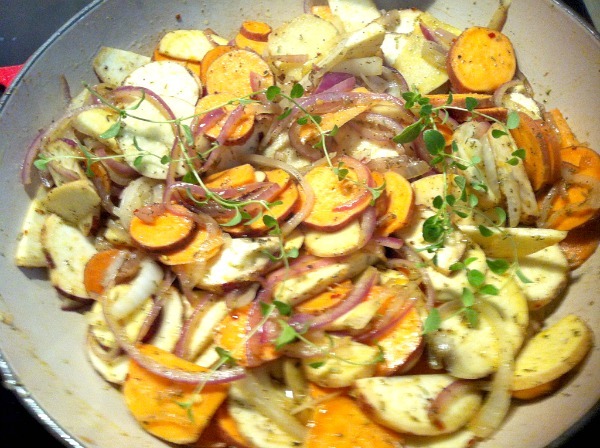 Place a piece of yuca, yautia, and name on a plate, and drizzle with olive oil. 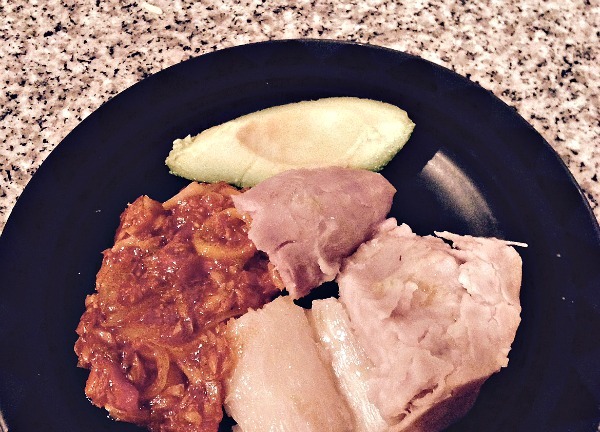 Add the bacalao guisado and a slice of avocado on the side, and you are finished.